How to Make Pasta: It's easier than you think. Make a mound of flour. 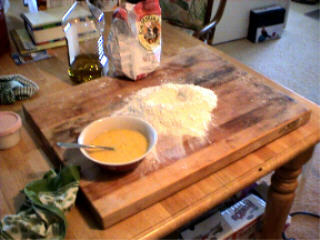 Scoop out the center of flour and place flour on sides. Place mixture in the middle of the flour volcano. With a fork, incorporate all of the flour into the egg mixture. Now knead the flour and egg mixture. This may seem difficult at first, because the flour and egg mixture will be very stiff. Knead until the dough is consistent throughout and takes on a silky sheen. Cover with a bowl or plastic wrap. 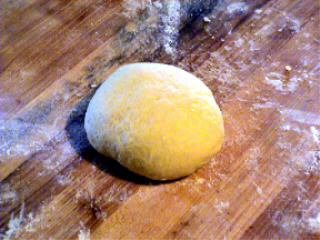 Allow dough ball to rest for 20-30 minutes. Variations: I will generally add 1 Tablespoon of olive oil to the egg and salt mixture. You may need to add more flour if you use this method.